If you have a child who's into wearing anime inspired outfits, some Pokemon costumes might be just the thing for him or her. Pokemon costumes, and in fact, the Pokemon craze, started in Japan (similar to the Power Rangers phenomenon) around 1995. The world of Pokemon was created by Satoshi Tajiri for Nintendo, and started as video games on the Nintendo Game Boy system. Since then the characters have been adapted to collectible trading cards, cartoon shows, plush toys and action figures - among many other products. Pokemon is a romanized contraction of the Japanese translation of the words for "Pocket Monsters" (Poketto Monsuta). The basic premise behind Pokemon as a game is that you, the player, are a Pokemon trainer. You must find and trap Pokemon, a type of small monster, and then train these Pokemon so that you can use them in battle against other Pokemon. These Pokemon are controlled by other Pokemon masters (usually other human players who also have the Pokemon game). If you win the battle, you get to keep the other master's Pokemon, thereby "collecting" that Pokemon. The goal is to collect every Pokemon in the realm of the game, which at this point numbers nearly 500. 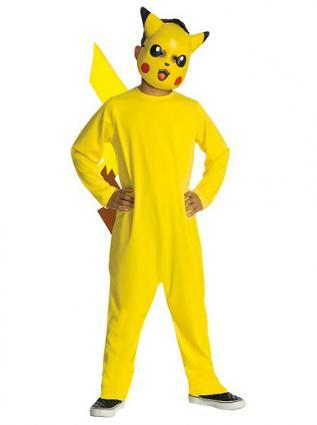 For most people, the Pokemon that stands out among all others is Pikachu, and his is the most popular of the Pokemon costumes. This iconic character is a main focus of the anime show imported from Japan that is still highly popular today. Pikachu is a small, cat-like character that is the main Pokemon pal owned by the focal Pokemon trainer in the show, Ash Ketchum. His ability to "zap" other Pokemon into oblivion, along with his cute and cuddly appearance, make him a fan favorite. His catchphrase is "Pikachu" (evidently, he is only able to say his name). Ease of design: Not all Pokemon are created equal. While Pikachu can be designed with a yellow hoodie, some black paint and a few extra embellishments, Bulbasaur may require a polystyrene flower and additional sewing work. Still other Pokemon can use elaborate structures to hold wings, while dressing as a Pokemon trainer may require the wearer to have an outfit that looks like what a teenage boy would wear. The Wearer: Little children often want to dress in Pokemon costumes, but some of these pocket monsters can be dangerous for smaller kids, due to pointy parts or difficult-to-remove costumes. Some easier costumes for little ones could be rounder characters like Jigglypuff. A costume of Jigglypuff could even be created with a stroller cover and some padding for the littlest Pokemon fans among us. Available Patterns: Pokemon costume patterns can often be found online, or you can design your own by taking a look at the detailed pictures found on fan websites. McCall's Costumes also made costume patterns for several of the more popular Pokemon (including Pikachu), and were made in 2000. They are now discontinued, but can be found through some sites including Ebay, and some sets are in perfect (patterns uncut) condition. This is a great way to ensure a more professional looking Pokemon costume. Be sure to find out your child's favorite Pokemon before creating the costume, however, as many children are loyal to their "own" Pokemon.